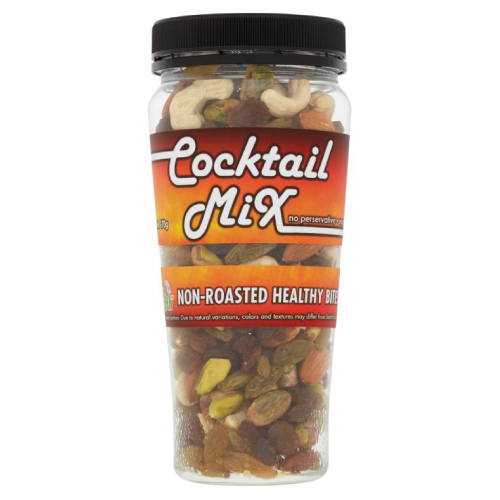 A healthy mixture of natural sultana raisins, natural green raisins, natural almond, natural cashew nuts and natural pistachio kernel, makes a vitality-boosting snack. Sultana Raisins – A good source of energy and packed with vitamin B1, B2 and various minerals as well as polyphenol antioxidant. Green Raisins – Rich in dietary fiber with high levels of catechins as antioxidant. Almond – An excellent source of calcium and vitamin E. Almond’s skin is full if heart-protecting compounds called flavonoids. Cashew Nuts – Contribute a good level of protein and source of minerals like iron, magnesium and zinc. Pistachio Kernel – Especially rich in vitamin B6 which is important for keeping hormones balanced and healthy. They also contain lutein and zeaxanthin that help protecting the eyes. Best consume within 2 months after opening. Please keep in cool and dry place. Away from direct sunlight. Refrigerate unused portion. Avoid exposing contents to moisture.